I wanted a purse that was oriented across rather than deep. 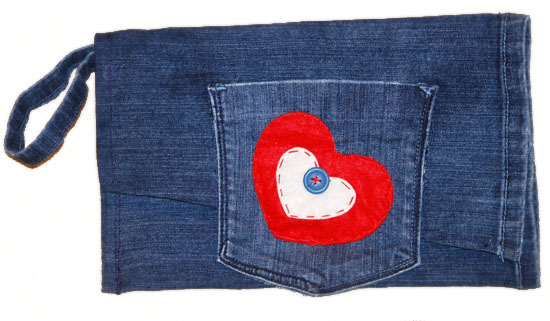 Recall that I didn’t really have a plan in mind, and I just went by the seat of my pants (or jeans if you like). 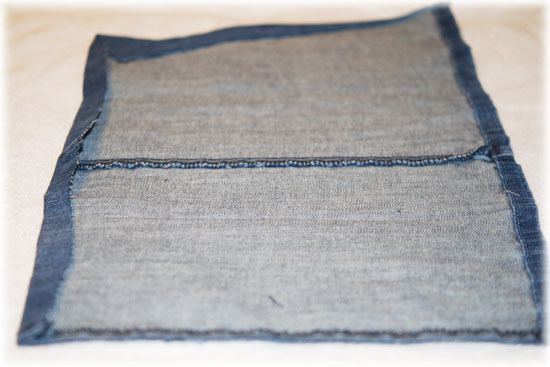 I ended up cutting them off about mid calf, but you will just have to decide what size you want your purse and then cut, leaving a little extra for your seam. Cut the leg lengthwise right along the edge of one of the seams (as close as you can) and open it up. Turn it under along the side opposite what was the bottom of the leg in a straight line and iron it down. This will be your edge. Stitch it with your machine. 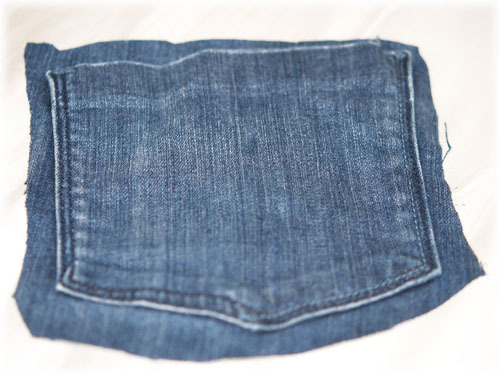 I wanted the top flap to be a diagonal so I folded and stitched it like that. When I was at the craft store looking for something else, I saw a cute heart ornament. 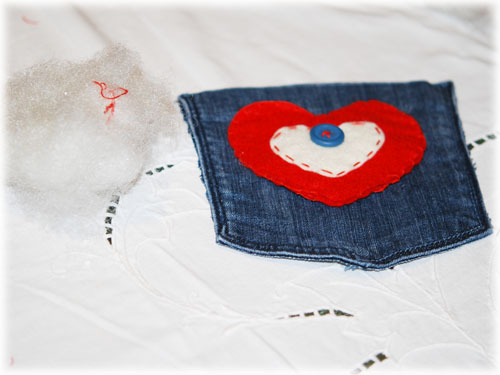 I thought it would make great embellishment so I bought it and when I was working on the pocket I knew it was perfect. I opened it up and took out the batting and then carefully stitched it onto the pocket with matching thread. I left one side opened a few inches so it’s actually a small “pocket on the pocket”. It would probably fit a little change or a small pen or something. 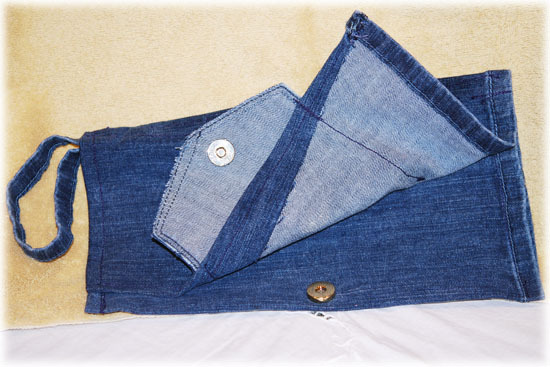 Anyway, cut out a back pocket from the jeans, embellish as you like. 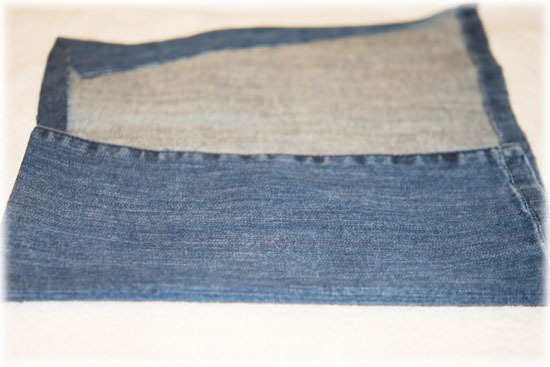 Cut as close as you can to the pocket to get off all of the *jeans*. 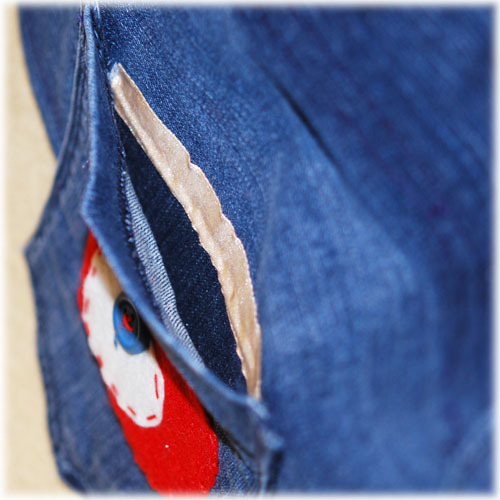 Also, cut down into the pocket but don’t remove much of the inside of the pocket itself, just a little of the top. 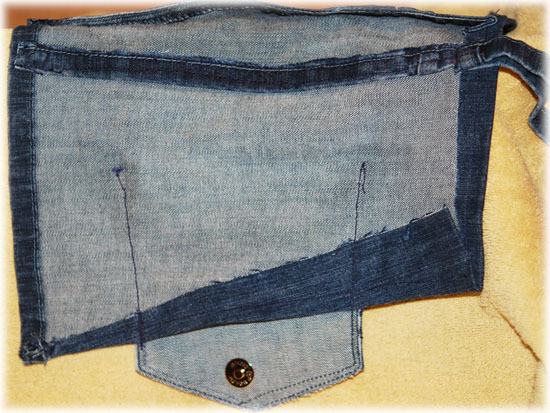 One problem with fabric purses is that they tend to be floppy, so I used the bottom hem of the other jean leg and sewed it along where the purse flapped over and then used that also to make a wrist strap. I ended up sewing it with 2 seams to make it more sturdy. 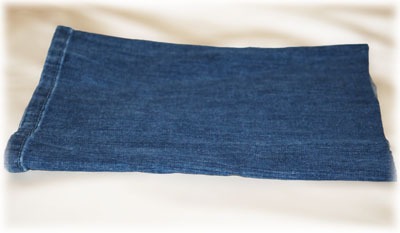 When trimming the seam to use, just trim really close and pick off the ragged threads. It will take a few minutes, but it will look fine if you spend a little time on it. 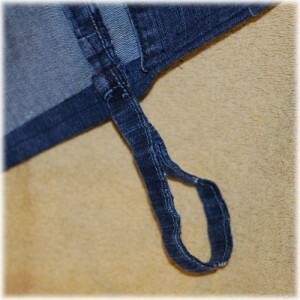 Be sure to sew the strap in with a couple of additional passes just to make sure it’s in there tight. I made it a little extra long so that it was easy to slip on and off. 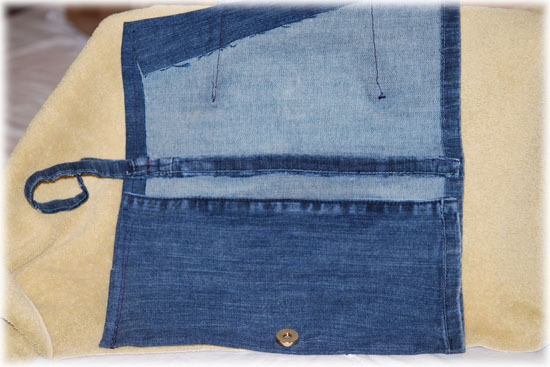 I decided I wanted the front pocket to also be the closure flap to put a magnetic snap on. So, place it on the front of the front flap and the match where everything needs to line up. 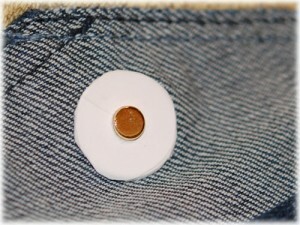 I pinned my pocket before sewing so things wouldn’t get out of line. You can see the stitching in this shot of the underside of the purse. Yeah, not very pretty, but it works. I let it hang down enough so that when the purse is closed you can grab the pocket to open the purse. One thing I didn’t even think of (poor planning!) was that this left the pocket open –that is, it wasn’t really attached to anything, so if you actually put anything into it it would have a 50/50 chance of simply falling right onto the floor! So, I had to use some Stitchery Witchery to *glue* the pocket back down to the purse. It worked *ok* but in hindsight I think I would use some fabric glue a little earlier in the process. I was afraid it wasn’t going to hold up really well, so I took a piece of ribbon and also used some Stitchery Witchery to cover the edge and make it a little more sturdy. Last thing (so I thought) was to put on the snap. I had bought a magnetic snap, and so I figured out where I wanted it. Basically, you just put holes where you want them place the prongs in there, put the backing on, bend the prongs, and your in business. 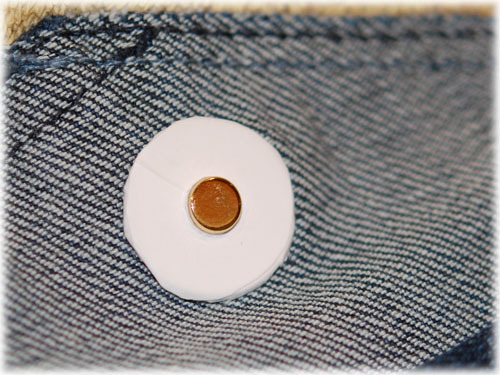 Some people actually put buttonholes, but it wouldn’t have been possible since I had already sewn up my access, but I think it’s an excellent idea. But as always, there was a fly in the ointment. The snap was SO strong it was difficult to open. I broke a fingernail) and I was afraid it would end up tearing the fabric eventually. So, I slept on it, and came upon an idea. What if I put some sticker paper over one side? Well, it worked (with my husband’s help). It took 2 layers, but at least as long as the sticker paper lasts it weakened the magnet enough to make it perfect. It does make you wonder, why on earth they would make the magnet so darned strong?! So. It was finished. A crazy project, took much longer than I imagined. Finished and shipped off, I hope it’s a hit. It was fun. I may make another. At least now I know what I’m doing. Sort of.